Not far from Helena, Montana, where Lewis and Clark passed through in 1805 on their epic western journey there is a two-mile stretch of canyon called Mann Gulch. This is rugged country, steep, craggy, and difficult if you are on foot. For the men and women of the U.S. Forest Service charged with managing wildfires, it is also something akin to sacred ground. Bitteroot Fire. Credit: Wikimedia Commons. Around noon on August 5, 1949, the air was shimmering with 97-degree heat when a lightening strike ignited a fire. Jim Harrison, a recreation and fire prevention guard at the Meriwether Canyon Campground, radioed in a call and started fighting the fire. Four hours later, a newly formed Missoula-based contingent of fire fighters called â€œsmoke jumpersâ€� parachuted down from a C-47. Within 90 minutes, 11 were dead, including Harrison, overtaken by a searing wall of flames 200 feet high. The fire that ultimately consumed them had temperatures nearing 1,800 degrees and literally sucked the oxygen out of the air. Unburned patches underneath the bodies indicated that most of the team, including Harrison, suffocated before the fire actually caught up with them. Two other crew members were severely injured and died within a day. Remarkably, one man survived: Wag Dodge, the foreman of the team. Dodge stayed alive that day because of a sudden inspiration. Leading his group down the north side of the gulch, Dodge sized up the rapidly expanding blaze and understood that they were likely to get trapped. 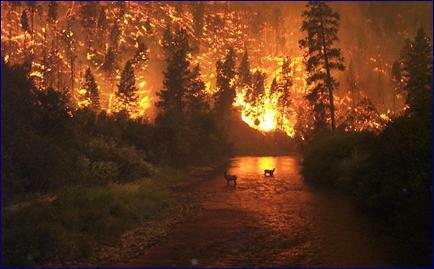 The fire had already ignited the surrounding grassland, blocking their only effective path to the river. Now the fire was flanking them and moving up rapidly. Dodge and his crew reversed course and headed up the 76% grade, but the fire was moving at 600 feet-per-minute. Dodge knew they would lose the race, but he invented a solution on the spot: he lit the grass in front of him on fire and watched it spread up the hill. Then, he lay down in the warm ashes and called for his men to drop their equipment and join him in the clearing. Panicked, the team ignored him and raced on. Most died. Wag Dodge had invented what is now a standard tactical operating procedure for fire fighters working in wilderness areas. It is called an â€œescape fireâ€� and is a part of every smoke jumperâ€™s toolkit, as is the â€œbackfireâ€� which is used to control large burns. Interestingly, the same technique was described in James Fennimore Cooperâ€™s 1827 novel The Prairie which Wag Dodge had never read. 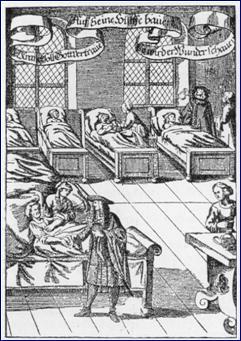 1682 German Engraving of a Hospital Sickroom. Credit: Wikimedia Commons. â€œEscape fireâ€� is a powerful concept. Karl Weick, a professor of organizational psychology at the University of Michigan has examined the Mann Gulch incident in detail and sees in it a collapse of a key and often undervalued organizational function: â€œsensemaking.â€� Viewing Wag Dodgeâ€™s team of firefighters as an organization, he believes that successful enterprises of all sorts actively create their own universe of explanations, motivations, and challenges. In the face of new, sudden, or bewildering circumstances, those understandings fall apart. Dodgeâ€™s team faced a crisis of major proportions, what Weick has called a â€œcosmology episodeâ€� in which the foundations of belief are shaken to the core. 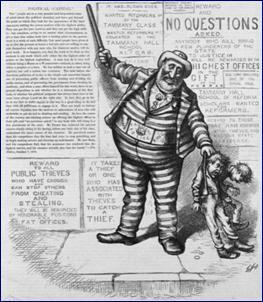 Boss Tweed Cartoon from Harperâ€™s Weekly. Credit: Wikimedia Commons. Politics is rough stuff. As practiced by Chicagoâ€™s Mayor Dailey, Lyndon Johnson, Boss Tweed, or Karl Rove, the usual rules for attacking politically-charged problems go like this: demand unquestioning obedience; reward your friends and punish your enemies; never concede, apologize, or explain; donâ€™t attack the problem, attack the person; dig up dirt on your opponent and use that dirt to tactically nibble him or her to death; do not tell your opponents what you are planning; go for surprise and limit their time for organizing. The first thing you need to do is renegotiate the rules and create a forum for constructive confrontation. In this forum, formal hats are off. Maybe it is all confidential if people need the forum to be secret. Everyone is free to explore without commitment. In fact, you encourage it. They are free to speak without reprisal and are safe enough to pursue odd and quirky ideas. Solution-seeking is no longer a battle to be won. It is a challenge to fix what is broken.